Bedside commodes provide a convenient way to transfer patients, yourself or a loved one from the bed to the toilet seat and then back. The bedside commodes we review below can accommodate a range of different weights and they come in different styles, with some different functionalities. Popular models include bedside commodes from medical supply brands like Drive Medical, Medline and Nova. One of our favorites is the Drive Medical bedside commode- an easy-to-assemble and sturdy option, often functioning as a handy 'back up' option in homes. It's also completely collapsible- so it's often used as a portable bathroom accessory for elderly or infirmed loved ones. Outside legs measure: 22.25" (W) & the width between its arms is: 18"
Let's take a look at 5 of the best-selling models and see how they compare - check out the video reviews below the comparison table! This gray commode comes with with steel welded construction and our testers described it as tough and durable. Storage and transportation will not be a problem as it can be easily folded flat in seconds. For added comfort and safety, plastic arms are also included in its features. 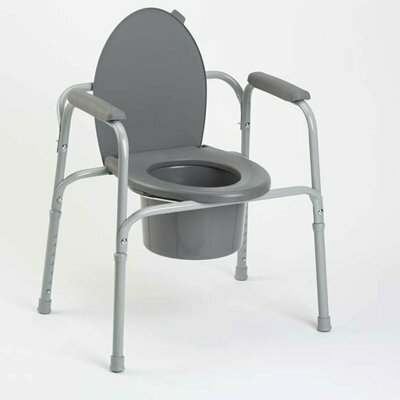 The complete set comes with a 7.5-quart commode bucket with cover, carry handle and splash shield. The bucket has to be precisely attached or it will easily fall through. It can accommodate a person weighing up to 350 pounds while the seat width is 13.5 inches and depth is 15 inches. Talking about versatility, this commode folds and unfolds in seconds without any fuss, making it easy for storage and travel. It can be used as a bedside commode, a toilet frame or as an elevated seat cover for existing toilets. For safety purposes, it is durable enough to accommodate a person who weighs 300 pounds or less. The seat height can be adjusted between 16 and 23 inches while the width between arms is 18 inches. The set comes with a bucket, splash guard and lid. No tool is required for assembly. This commode has some great features- it has a sturdy and ergonomic design making it suitable to be used as a stand-alone unit or as a seat cover for a regular toilet. The back and arm rest allows for comfort while sitting down. It features non-rust aluminum legs and non-skid rubber tips to keep it firmly in place. Depending on the height of the user, the legs can be adjusted from 16 to 22 ½ inches. The bucket has a capacity of 10 quarts and comes with a splash shield and cover. 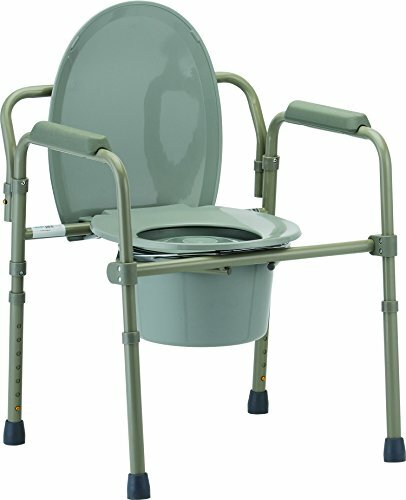 A multi-purpose steel commode, this product is both safe and durable and can sit a person up to 300 pounds. It can be used as a bedside commode, higher toilet seat or a safety toilet frame. Important features include a greater seat opening, 16 inches wide snap-on seat with lid, arm and back rest and non-slip rubber tips. The height of the legs can be adjusted from 23 to 29 inches and the base width is 25 inches. Buyers get a 5-year limited warranty with this product. Yet another option with fairly solid endorsements from our user base, the Invacare is another solid option that is particularly secure. 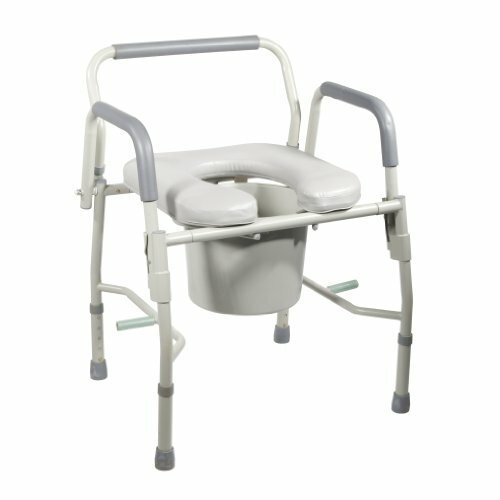 This Drive Bedside Commode can be configured to be used as a toilet safety frame, bedside commode, or an elevated toilet seat. Easy to assemble in 4 steps, it comes with padded back and armrests, splash shield and carry handle. The bucket has a 12-quart capacity while the seat is padded for comfort. Leg height can be adjusted by simply pushing a button. Overall dimensions are 20” length, 23.75” width and 35” height. The width between arms is 19 inches. This product can be safely used by a person weighing up to 300 pounds. 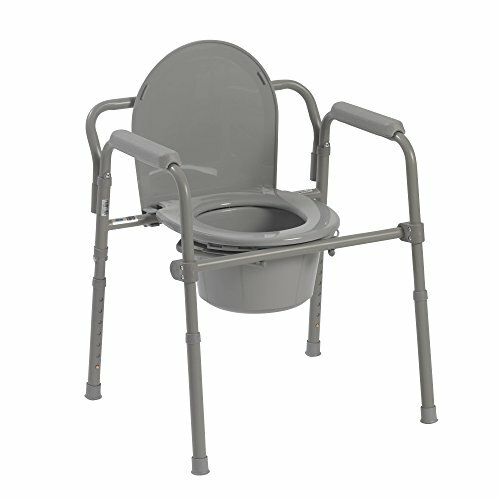 These commode chairs are essentially mobile toilets intended to be positioned near the bed of individual that is disabled or potentially recovering from surgery. Either way, they are convenient solutions for individuals suffering from mobility impairments. Typical features of these commode chairs include a sturdy frame and a receptacle to gather waste that is simple to remove, empty and clean. Many users liked that the chairs assemble and disassemble without the use of tools. While the waste receptacle is removable, and that is obviously essential, it’s important to secure the receptacle back in place firmly after disposal so that it does not drop out. Many users also use this device over the toilet itself, which is convenient if it is difficult for you or a loved one to sit on a low toilet seat. If you or a loved one are especially tall or heavy, it’s a good idea to scrutinize the available options prior to purchase so that you select one that can accommodate your size requirements. 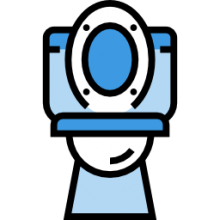 The average we capacity of your typical commode chair it’s around 300 pounds. The removable receptacle often comes with a handle to make transport to the toilet for waste disposal as easy as possible. These items are typically very light, and users liked that they were particularly portable for use back-and-forth between bedroom and bathroom. Foldable designs make some commode chair is especially convenient store and to pack during trips. How realistic is aging at home for senior citizens? It will come as no surprise that most seniors want to continue living in their own homes as they age. An AARP survey demonstrated that 90% of senior citizens wanted to continue living in their current residence as they age- this phenomenon is known as aging in place. Unfortunately, this is not a realistic option for every senior. 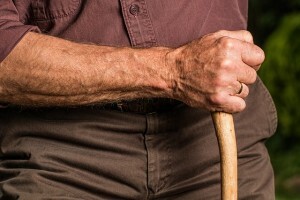 A government survey has indicated that up to 70% of people who reach the age of 65 inevitably will require a long-term care. Seniors who have family members that can help or who can’t independently afford the costs of in-home care can often manage to stay in their own home. However, many seniors don’t have family that is able to take on that duty and in-home care can be pretty expensive, plus it isn’t covered by Medicare. Another factor is that seniors may be stricken by serious medical disorders that make their ability to age in place impossible. Serious medical conditions like Alzheimer’s or strokes require a great deal of medical care and supervision, something that families or even homecare providers are not able to effectively deal with. That said, if you know a senior who wishes to age in place, one of the best things that you can do is some preventative safe-guarding of the residence. Since falls are one of the most common causes of visits to the emergency room, as well as a major cause of accidental deaths of individuals over the age of 65, ensuring that your senior’s home is modified to reduce the risk of falls can be a robust preventative strategy. Planning ahead in this matter is an effective strategy to ensure that the elderly person in your life is able to age in place for as long as possible.